A Romanian translation of this page, courtesy of Web Geek Science. 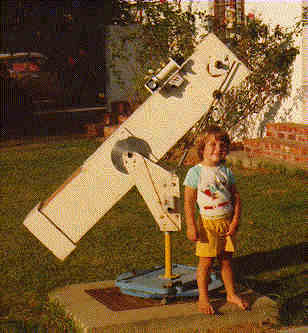 Around 1990, I got this telescope from a former astronomer at SAAO, Drummond Laing, shortly before he retired. He in turn got if from a neighbour who dug it out of his attic just before Halley's Comet came around in 1985 to "see if he can do anything with it since he is an astronomer" . It seems to have been built by some relative of this person and when he died, nobody in his family knew anything about telescopes and it ended up being dumped in the loft. It turned out to be a 9" f/6.5 Alt/Az mounted reflector almost straight out of Jean Texereau's "How to Make a Telescope (1957)". (This was confirmed by Lloyd Horton in this mail from my Telescope FAQs Page.) Drummond improvised a little to make up something to replace the missing bottom half of the mount and managed to observe the comet after which he never used it again. The first thing I had to do after I got the scope was to make up something more permanent to serve as a stand but because of the over-balance design of this type of mount, it was prone to an enormous amount of vibration. After a fresh coat of aluminium on the the mirrors, I had an adequate tool to start exploring the wonders of the Southern skies. I soon added "setting circles" in the form of plastic pro-tractors and after modifying Larry Puhl's PLANET program (now ASTRO.ZIP .. info) to give real-time Alt/Az output and with my (then modern) Olivetti M15 Laptop, the sky was (not) the limit. I was then still resident at the Sutherland Observatory outstation in the Karoo and with this site's excellent skies, was able to view a few very nice objects in the process of learning my way around the sky. With the help of this software and the setting circles I even managed to find planets and bright stars during the day. Portability - the telescope/mount must be able to be taken apart to fit into a car. Quick assembly/disassembly - with minimal (if any) tooling required. Stability - the mount must have little or no vibration when moved or bumped. Track - the telescope must be able to track the motion of the stars automatically. Collimation adjustment - must be reachable while viewing at the eyepiece. Rotatable front end - to be able to get the eyepiece into a comfortable viewing position. Photographic ability - focus must be able to adjust to reach the focal plane of a 35mm camera body. See how I determine focus and calculate exposure time for astrophotography. 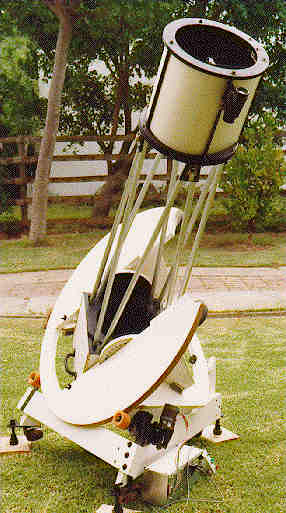 The choice of mounts that are stable and portable enough ended up being between a Dobsonian and a Split-ring equatorial. Although a Dobsonian can be made more compact it is more complicated to drive. 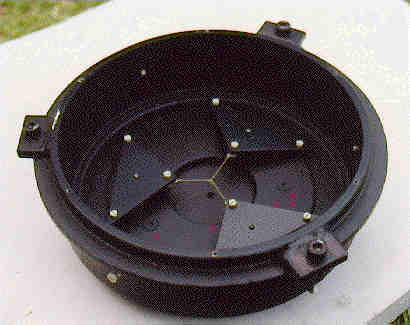 Dobsonian drive options were either an equatorial table or a dual axis computer controlled drive. An equatorial table for 33° latitude has its problems and my Olivetti was not powerful enough for the computerized drive. In the end I opted for a fold-able Split-ring Equatorial. Here is an animation (160k) if you want to see how this was accomplished in 5 easy steps. Since I was basically designing as I was building, this was about the closest I ever got to any kind of an "engineering drawing". Also visit the page on my Satellite Tracking Scope.